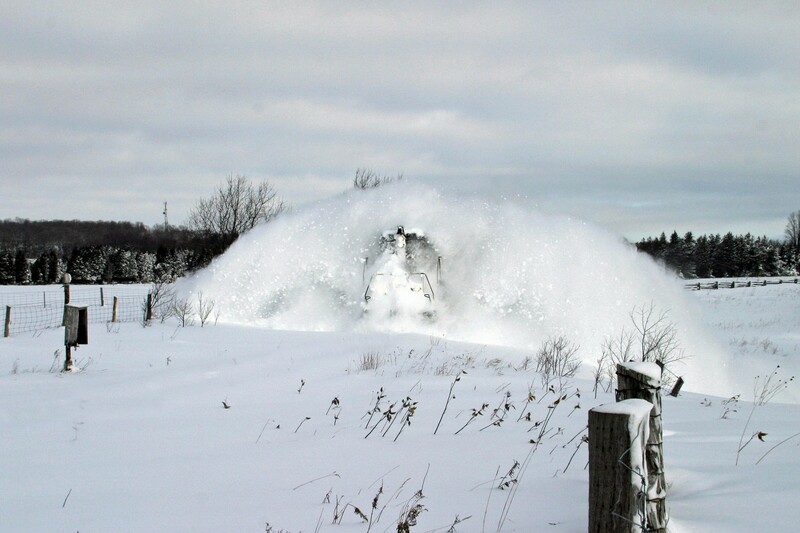 Railpictures.ca - Steve Bradley Photo: CP’s old Owen Sound Sub was renowned for snow, and certain areas were always known for their drifting, even south of Orangeville. Shortline operator Cando, did not have the luxury of the plows that CP had regularly assigned to Orangeville, so when drifts were encountered, it was ” put her in 8 ” and blast your way through. That is exactly what southbound high-nosed Geep 1000 is doing at Mile 31 on this blustery Feb 7 2006. | Railpictures.ca – Canadian Railway Photography – photographie ferroviaire Canadienne. Caption: CP's old Owen Sound Sub was renowned for snow, and certain areas were always known for their drifting, even south of Orangeville. Shortline operator Cando, did not have the luxury of the plows that CP had regularly assigned to Orangeville, so when drifts were encountered, it was " put her in 8 " and blast your way through. That is exactly what southbound high-nosed Geep 1000 is doing at Mile 31 on this blustery Feb 7 2006. All this just to get to the phone box and find out it is a wrong number. Just kidding. GREAT image, Steve.